Although abolished a few decades ago, for much of Connecticut’s history colonial, then state law required that towns regularly perambulate their boundaries and establish and renew bounds on said boundaries under penalty of a fine. This was to be done every year at first, before being changed to every three years and then every five years during the 1800s, before being struck from the books. This timetable was not always followed, as I was only able to locate perambulations from 1812, 1849, 1860, and 1914 in the case of the New Hartford and Barkhamsted town line. Perambulations were more frequent in the case of the Winchester and Barkhamsted line, although I only located the 1885, 1900, and 1921 perambulations. I’ve typed both perambulations, making some minor formatting changes and spelling corrections. Here are the New Hartford / Barkhamsted perambulations and the Winchester / Barkhamsted perambulations. Quoting from chapter two, section fourteen of the 1866 Connecticut General Statutes, “Every town shall procure its bounds to be set out by plain and durable marks and monuments, which shall be a large heap of stones, or a ditch six feet long and two and a half feet wide, or ordinary depth, at every corner, and once in every eighty rods, in the lines running from corner to corner.” I have located most of the bounds closest to the southwest corner of Barkhamsted. 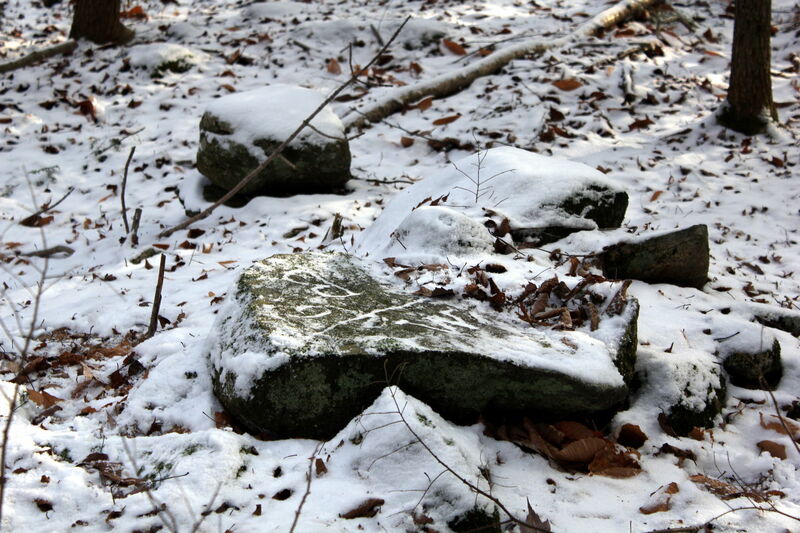 Most of these bounds are stone cairns with the town initials carved into a stone on the top. Unfortunately, these bounds have not been renewed in close to a century, and I was not able to locate all of the bounds I looked for. Of the remainder, most were in good shape, although the letters carved into the stones were worn and difficult to read during the summer. 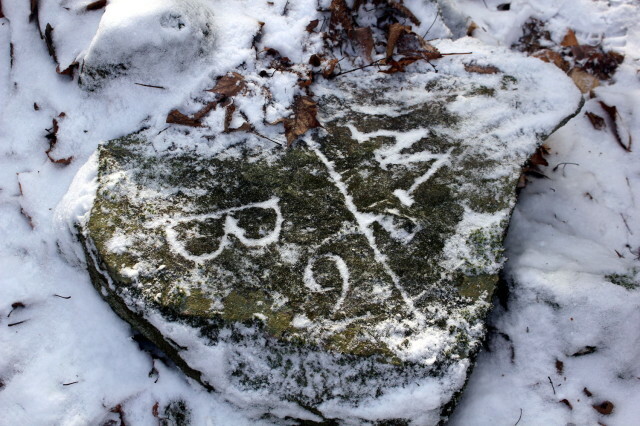 In addition, the large flat rock marking the four-corners of the towns of New Hartford, Barkhamsted, Winchester, and Torrington was disturbed and is cracked in two. Below is the second bound on the Winchester and Barkhamsted town line with snow making the markings clearly visible. Update: I have since found copies of 1858 and 1866 perambulations of the Barkhamsted and Winchester town line as well as the original copy of the 1860 New Hartford and Barkhamsted perambulation in Henry Norton’s survey minutes in the Connecticut State Archives (RG 069:037). This entry was posted in Research and tagged Barkhamsted, bounds, Connecticut, New Hartford, perambulation, town line, Winchester. Bookmark the permalink.